That’s not saying much. There have only been four Republican presidents since LGBTQ issues have been on the national radar, and one of them is best known for ignoring the HIV/AIDS epidemic. Michelangelo Signorile caught up with Angelo at CPAC this weekend and asked him what he thought about Trump, one year into his administration. Is Trump still pro-LGBT after he tried to purge the military of transgender people? And what are those pro-LGBT things? Notice Angelo’s choice of words there. Trump has long opposed marriage equality and has never come out in favor of it. That’s why Angelo doesn’t say that Trump supports marriage equality – he clearly doesn’t. Trump has just said that he recognizes that it’s “settled law,” referring to the 2015 Obergefell decision that legalized marriage equality. Which, of course, Obama couldn’t do in 2009, because that was six years before the Obergefell decision. Marriage equality was just plain not settled law at that time. Now, Angelo’s point is probably that Trump didn’t have to agree that Obergefell is settled law. He could have undermined it or spoken out against it. He could have acted like an early 19th century president and just ignored the Supreme Court ruling. Obama, on the other hand, appointed two of the justices who joined the majority in Obergefell‘s 5-4 decision. Considering Trump’s judicial appointments so far, it’s safe to say that he wouldn’t have done the same. Gay Republicans justify their work by saying that they’re changing the GOP from the inside. 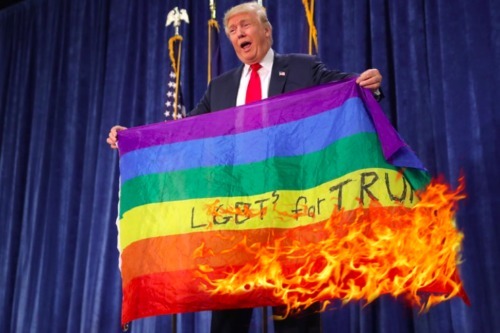 But if they celebrate Trump because he accepted one (but not all) of the LGBT accomplishments of the previous Democratic president, I question their ability to put pressure on Republican officeholders.